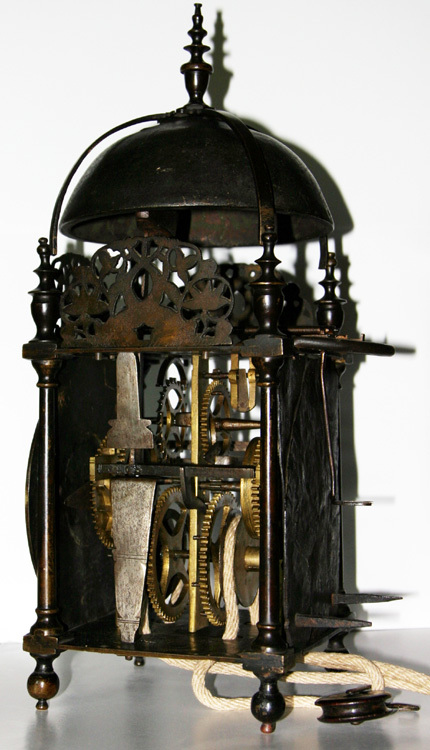 A rare, second period, West Country lantern clock with pierced dial centre. Two near-identical clocks are illustrated in the George White book on page 140. This example, however, is the most original and complete of the 3 recorded to date. 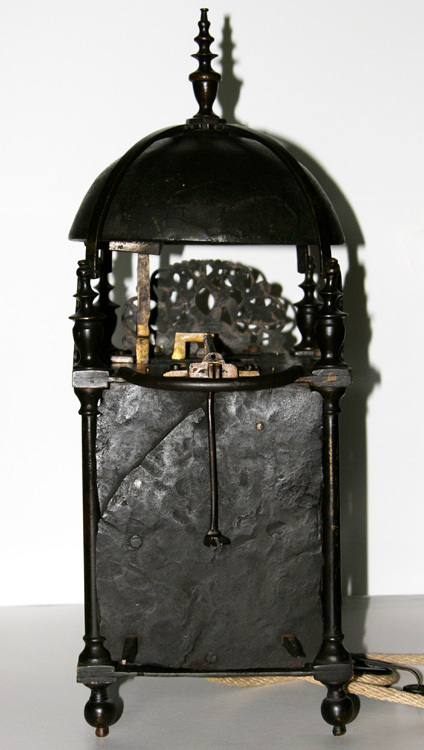 Originally constructed as a balance and benefiting from a very early conversion to royal pendulum in the style of William Clement (see detail photograph). The conversion appears to have been made circa 1685-1690. 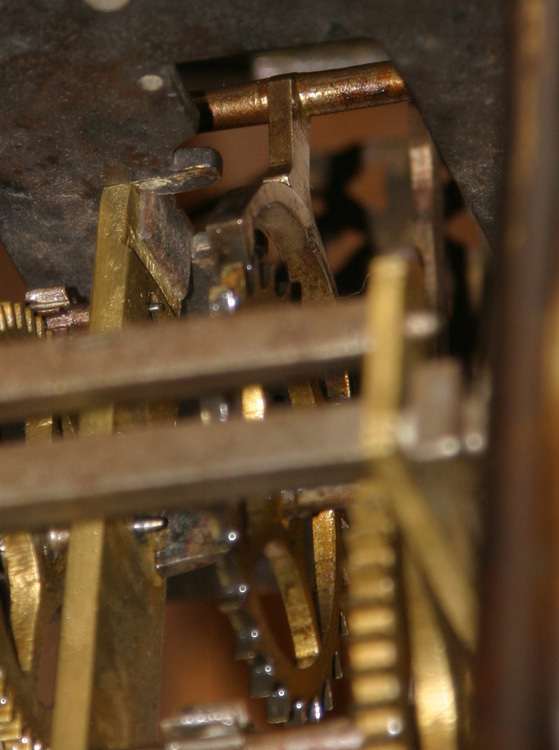 The clock when in its balance wheel format was driven by two separate weights with click winders on both strike and going trains. Now in anchor escapement format, the lantern is powered by a single brass covered weight using the Huygens continuous rope system, the click winder being on the going side only (strike side is fixed drive wheel). Nice early sliding bob pendulum, 2 7/8" diameter bob. 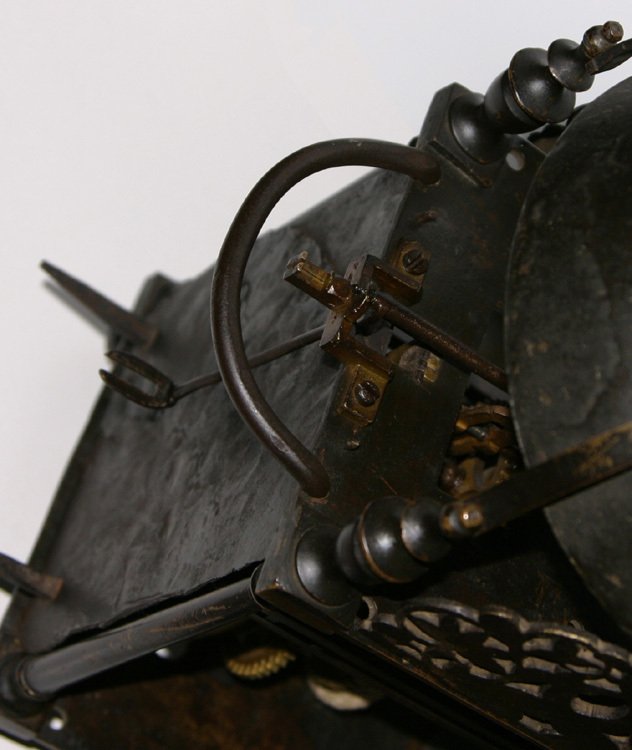 The clock has very ornate and detailed hammer spring and hammer stop. Heavily tapered arbors, typical of second period lanterns. Retaining its original iron back plate with interesting stop peg to restrict strike count lever from being misplaced. Unusual rear hoop being of formed round bar (see detail photograph). The hand is of cast brass, West Country type and certainly correct for this clock. 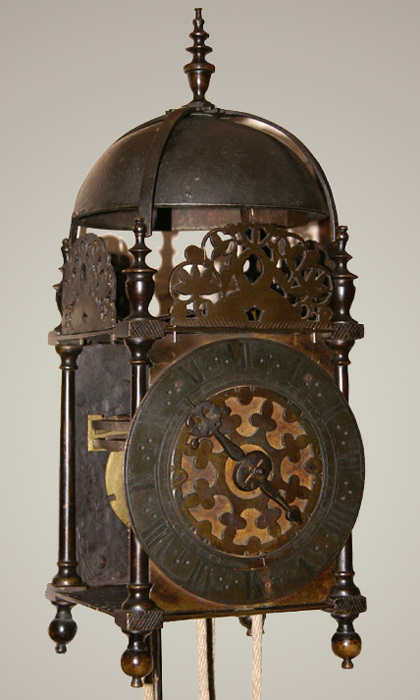 The front dial has an ornate pierced cast brass dial centre in place of engraved decoration. Naive engraved markings to the faces of pillar fronts and lower edge of frets, presumably done by the maker due to the non-availability of an engraver. Evidence that doors were once fitted but have since been lost. The clock has beautiful dark brown patination and still has most of the original mercury gilding/fire gilding. The depth of the patination gives an indication that this clock has not been altered or cleaned for many years. This lantern has an abundance of small but significant details and markings. A truly stunning and original clock. The clock having 6" square frame, 6 1/4" diameter chapter ring of 1" width and finely engraved 6 3/8" high dial plate. The clock stands 16 1/2" high to top of bell finial.